This week would be a dark one for the whole world. All European airports are closed, flights are cancelled and planes remain on the ground because of a volcano in Island which is suddenly awake and fills the sky with its ache. The same weekend, an African man, Sotigui Kouyate, dies. What a coincidence! A big Nordic volcano is announcing in a way the departure from our world of a great man. The ache is like a fire work celebrating the last trip to the upper world of a man who spent his time doing a lot here below. A sad week for African culture: Sotigui Kouyaté passed away. What a loss! Since the weekend, press agencies forwarded the information. During the week, African newspapers are making place to give a last homage to the actor who brought the name of Africa in the most important international spheres. Acting for cinema and for theater, directing theater plays himself, story teller and singer, he was the incarnation of the Africa Griot. Chadian film maker, Mahamet Saleh-Haroun, dedicated him a portrait called: Sotigui Kouyaté, a modern Griot. The last few appearances of Sotigui Kouyaté were nothing else but honorable. February 2009, he is awarded the Silver Bear in Berlin Film Festival as best actor for his role in London River by Algerian film maker Rachid Bouchareb. Few months later, in Cannes Film Festival, he received the medal of'Officier des Arts et des Lettres', a high recompence, by the French Ministry of Culture. They are not a lot, African actors who could reach this kind of celebrity and stand on the international stage with such a merit. But there is no hazard in this. Kouyate did a lot and did the best. For cinema or for theater, whenever he is involved in a work, it is a big success. Great film makers count on his professionalism and generosity. With Africans he would work with film makers such as Malian Cheikh Omar Sissoko in The Genesis (1999), Nigerian Mustapha Alassane FVVA: Femme, ville, voiture, argent (1972), and Toula ou le genie des eaux (1973) and Algerian Rachid Bouchareb in Little Senegal (2001) and recently London River (2008). With his charisma and his talent, he could figure in works of artist more internationally quoted like Peter Brook. Sotigui Kouyate reached the highest point of his career as an actor when he worked on Mahabharata (1988), the monument of cinema and theater realized in the cadre of the "International Centre for Theatre Research" created by the British dramaturge in Paris since 1970. Kouyaté played, with great talent, the role of Parashurama / Bishma which means in Sanskrit God on earth. Probably, was he so divine. Because he was physically tall, and because of the warmth he gives all around him he was perfect for this kind of holy roles. When you meet him even for the first time, and this happens to me in 2006, Kouyate begins always by greeting you whatever your age is. In 2007, he accepted to visit the Cinematographic Framework of Hergla, a small film forum in a very small Tunisian village. He came, met young people of the village and shared his time and his wisdom with everybody showing that the smallest part of Africa also belongs to him. He has a kind of magic availability to take you under his protection. Jean-Claude Carrière, famous French writer, said once that Kouyaté has a "special smell which gives the feeling of peace and warmth when you are close to him". When you are in front of him, even if it is for the first time, you feel spontaneously that he is somehow yours. I interviewed him at the occasion of Cannes Festival last year. He was looking really weakened. I told him that if he feels tired we can cancel our interview. His answer was completely disarming: he would never say no to someone who asks him whatever as far as he has the little energy he could have. And that's also what he was doing at that time. He was still busy with the creation using all what he could have as energy. His last works where dedicated to Africa. In July 2009, he presented Salina a theater play written by Laurent Gaudé, in the Third Panafrican Festival of Algiers (July 05th-25th 2009). 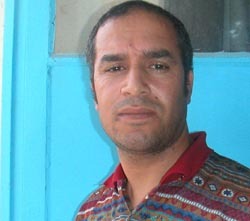 For the same event he collaborated to Errance, a short film made by Tunisian film maker Nouri Bouzid. The film was about the representation of black Africa in the mind of Tunisian people. These would be perhaps the last professional appearances of the African Griot. Kouyaté lived in Paris but traveled often to Africa to organize projects: "I want to be involved in my continent. He told me last time I met him. I have already directed two stage plays: Antigone and then Oedipus, which we played in Mali, Burkina Faso and Niger. I am currently working with another one. Hopefully it will tour Africa." His last trip to his home continent was then supposed to be a tour with his last play Salina. Now, it is going to be a one-way travel. European airports reopened and first flights could be possible last Wednesday. The artist could finally go back to his last residence in Burkina Faso. Wednesday, he will be buried in his family land. The same day, in Tunisia, artists of cinema and theater gathered to give him a last adieu showing his last images and remembering what he left behind him. The African Federation of Film Critics and all journalists around the continent are exchanging condolences and giving him tributes. Everybody says almost the same thing: Does an African Griot ever die? !